I have never owned a Terrier before. I had no idea how much they enjoy being under blankets…in the middle of a heatwave. Misha did not start out as a blanket dweller. 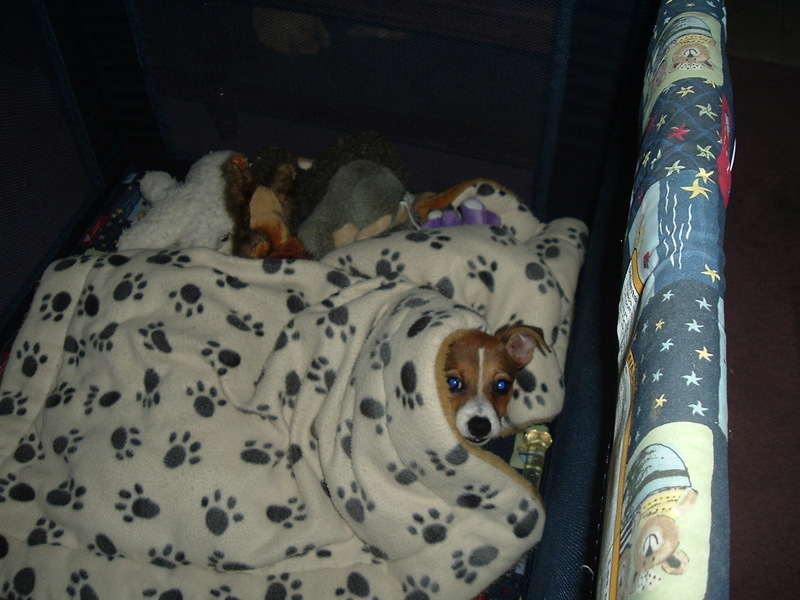 But, around 3 months she was playing in her playpen (we kept her in one when we needed a sanity break). She was throwing toys around. Then, she picked up the blanket and hid under it. She would pop her head out, run around, then go back under. It was a great game! I got this photo of her that day. See how she is peeking out? It took a couple more days before she started to sleep under her blanket. From then on, she preferred sleeping under it rather than on top of it. Sometimes she is hilarious when she is under her blanket. I’ll catch her stalking the family, one eye poking out to see if anyone is getting food. I’ve taken many photos of my clown and her blanket. This will be a regular feature on this blog called “The Blanket Break”. Look for it if you need a chuckle! Misha is my favorite internet dog. Always entertaining….and I don’t have to pick up poop!